Everybody needs to get away every now and then. However, the cost of holidays can be prohibitive for some people. It doesn’t have to be, it just requires some creative thinking. We’ve come up with some ideas for travel on a budget. These are just the beginning though – you’re sure to start coming up with ideas of your own too. A camping trip is about the lowest cost holiday you can go on. 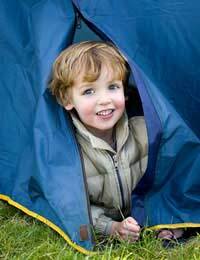 Most kids will love camping so it's a great family holiday option. Camping in Britain can be great fun and there are some excellent low-cost campsites in picturesque parts of the country. However, camping in the UK doesn’t have the most glamorous image ever and that’s largely down to the weather. In the UK you take your chances more than you do abroad. However, camping abroad is also an option and the cost can still be very reasonable. Campsites abroad are still cheap and the travel can be affordable too due to no-frills airlines, budget ferry deals and the possibility of driving. If money is really tight, you can still have something of a holiday atmosphere at home. Take a week off work and come up with some ideas for really exploring your local area. It’s likely that you’ll be surprised at some of the things you haven’t visited or tried yet that are right under your nose. If you plan far enough advance you’ll also get low cost train fares to visit surrounding areas. You’ll still save money on accommodation and can keep costs down further by taking your own packed lunch and drinks. One of the biggest costs associated with travel is usually accommodation. You could get your lodgings for free by house swapping! There are plenty of house swapping websites where you can link up with other people who want a house swap holiday. There are people from the UK, but also people who want to travel here from all over the world. You could go pretty much anywhere for a fraction of the cost you'd normally pay. Travelling and holidays abroad can be very low cost if you do things right. They’re called youth hostels but that doesn’t mean they’re only for the young. Most European cities are full of low-cost youth hostels and many now have family rooms or double rooms for couples too. No-frills airlines are now commonplace and you can literally fly to European destinations for pence on some occasions. In some countries you will also get more for your money while you're there as the cost of living is much lower than here in the UK. If you have children, holidays to camps such as Butlins and Pontin's can be ideal. Accommodation costs are usually low and much of the entertainment is often free or low-cost, such as swimming, playgrounds and activities. Often these camps are near beaches too, which kids will love. If you fancy a holiday camp break, keep your eye on the papers as they often have deals where you can collect tokens for a free or very cheap break.